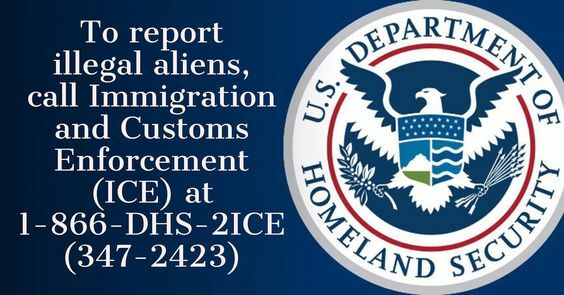 How to report illegals? How to Report Illegal Immigrants? How to Report Illegal aliens? How to report employers of illegals! All across America, our citizens are suffering crimes, job losses, depreciated wages, stolen taxpayer resources, stolen elections, and many of the other problems caused by illegal immigration. If you need to report illegal immigration, you will need to call the number below for the Department of Homeland Security (DHS). But it is our job here at ALIPAC to inform you that you may not get an answer at this number, or you may get a rude response from DHS agents even if you have solid evidence in hand to report illegal immigrants. Many Americans are not aware that Barack Obama supports illegal immigration and Amnesty for illegals and therefore is violating his Oath of Office, the US Constitution, our existing immigration laws, and the well being of a majority of Americans by refusing to enforce our laws. So call this number to report illegal immigrants, but keep in mind that the chances Obama's Department of Homeland Security will take action until after an illegal alien rapes or kills an innocent American are slim. Barack Obama has ordered these taxpayer funded agencies to serve illegal immigrants and their interests instead of American citizens. If you disagree with this as we do at ALIPAC and if you feel that America's existing immigration and border laws should be adequately enforced and that our federal law enforcement should be protecting American jobs, wages, taxes, elections, and lives from illegal alien invaders and the terrorists among them, please join our e-mail alerts on the left to join our political efforts to restore the Rule of Law. If you want to know which lawmakers, pundits, activists, and groups are to blame for this betrayal of trust and amnesty for illegal aliens in America which results in so many lost jobs, taxpayer resources, elections, and lives, then visit ALIPAC's illegal alien amnesty supporter list page for the names of the traitors, and their contact information. Send DHS a message online. Submit a tip to the FBI online. Please explore our archives to learn more about problems with illegal immigration, the history of illegal immigration, and many of the polls, surveys, facts, and statistics we have about illegal immigration. If you would like to post your story of how illegal immigrants are harming your life, please visit our online forums here at www.ALIPAC.us where our online activists are ready to assist you 24/7. Join our e-mail alerts today and help ALIPAC tell our government to do their jobs!